The 2011 Budget was delivered by the Minister of Finance, Pravin Gordhan in Parliament on 23 February 2011. As one of the tax proposals announced by the Minister, transfer duty on property was lowered. 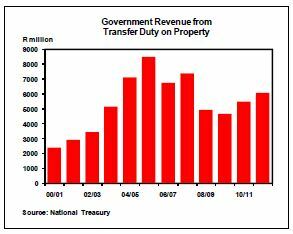 This was the first time since the 2006 Budget that the rates at which transfer duty on property will be payable, was adjusted. In the 2011/12 fiscal year no transfer duty will be payable on a property priced at R600 000 or less. 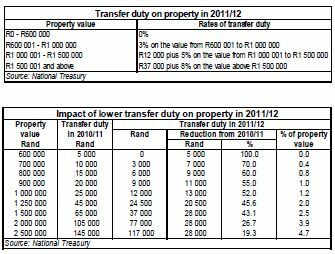 The revised transfer duty rate structure (see tables below) will apply to properties sold in terms of purchase agreements concluded on or after 23 February 2011. This will also apply to legal persons, such as closed corporations, companies and trusts. The maximum value of a property exempted from transfer duty was R100 000 in 2002/03; R140 000 in 2003/04; R150 000 in 2004/05; R190 000 in 2005/06; and R500 000 in the period 2006/07 to 2010/11. The adjustment to transfer duty on property is estimated to cost the fiscus R750 million in lost revenue in 20011/12, with the revenue from this source budgeted at R6,1 billion in the current fiscal year. The further lowering of transfer duty on property is an effort by the government to promote homeownership and address the affordability of housing, especially in the lower-income categories of the population. This, in conjunction with the government’s housing subsidy and banks’ mortgage lending criteria for low-income and first-time homebuyers, will support the lower end of the market. In view of no further interest rate cuts expected in 2011, which have been a major supporting factor in the residential property market in 2009-2010, lower transfer duty will be a positive factor contributing to the performance of the property market in 2011. An expected higher level of economic growth, some employment growth, personal income tax relief announced in the Budget, and growing real household disposable income, will be additional factors supporting the residential property market this year. Disclaimer: The information in this publication is derived from sources which are regarded as accurate and reliable, is of a general nature only, does not constitute advice and may not be applicable to all circumstances. Detailed advice should be obtained in individual cases. No responsibility for any error, omission or loss sustained by any person acting or refraining from acting as a result of this publication is accepted by Absa Group Limited and/or the authors of the material.